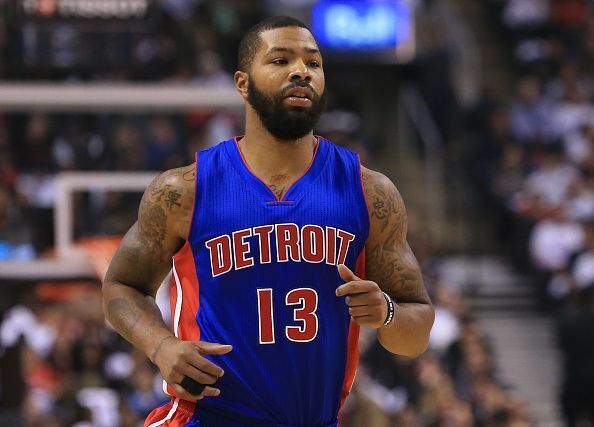 Marcus Morris is a power forward who plays for the Boston Celtics in the NBA. The 28-year old stands at 6’9’’ and weighs 235lb. Morris dons the number 13 jersey for the Boston Celtics and likes to wear the Nike Lebron Soldier 10. He finished the 2016-17 regular season with an average 14.0 points per game and recorded a career high of 37 points with the Detroit Pistons. He was born on 2nd September 1989 in Philadelphia, Pennsylvania. He was more interested in football, until he was convinced by Dan Brinkley that if he played basketball, he could one day afford to buy a football field and play to his heart’s content; Dan later went on to become his agent. Morris earned college scholarship and went to the University of Kansas, majoring in American Studies. He played with the Kansas Jayhawks, one of the most successful basketball programs. A regular starter for three years, he averaged 12.6 PPG, and 6.2 rebounds in 109 games. He was picked by the Houston Rockets in the 2011 NBA draft, where he was the 14th pick in the first round. He made his debut on 26th December 2011, in a 95-104 defeat to Orlando Magic. He got to play with his twin brother when Marcus was traded to the Phoenix Suns in 2013. It was the second time in the NBA that twin brothers played for the same team. However, his time at the Suns can be best described as torrid, as he was labelled notoriously as “one of Arizona’s biggest sports villains” because of an altercation with head coach Jeff Hornacek. Controversy happened to follow Marcus, as he and his brother were involved in two aggravated assault cases in 2015. And despite being considered innocent, it was one of the many reasons why he was traded to the Detroit Pistons for the 2015-16 season. During the two seasons at the Pistons, he regularly started and earned game time. He helped the Pistons reach the playoffs for the first time since 2009, as he averaged 14.1 PPG and 2.35 APG. 2017 saw Morris traded to the Boston Celtics in an exchange deal for Avery Bradley during the off-season. With the horrific injury to NBA All Star Gordon Hayward, Morris was expected to step up and he quickly proved his worth to the team. Morris won the Big 12 Player of the Year award in 2011 and was named in the second team of the All Americans for the 2010-11 season. He was listed as the No. 10 power forward and the No. 29 player in the USA, while considered a four-star recruit by Rivals.com in 2008.